Yesterday I caught myself complaining again as I attacked the mountain of dishes in the sink and tried to clear away the fog from my bleary eyes and brain. Clearly, my morning cup of coffee had not kicked in yet. As I let out an audible groan, my husband and toddler both glanced at me from their respective spots in the kitchen. My husband is a bit of a Zen master – or at least that’s what I’ve dubbed him. It comes naturally to him. When he’s confronted with a mountain of dishes (or a mountain of anything) he tends to just dive in and deal with what’s in front of him without much of a complaint. He figures that ‘it is what it is’ and groaning about it won’t make things any easier. He often accepts things for what they are and simply takes action. Me: UGH. There is always a mountain of dishes for us in the sink, laundry piling up, and just so much to do. It’s not even 8:30am and I’m ready for bed. This is pointless. I feel so overwhelmed by the day already. Live-in Zen Master: I know. It’s frustrating. There are a ton of dishes, and laundry, and things for both of us to do today. Live-in Zen Master: But to put it into perspective – look around for a minute. At our house, our children, and the beautiful view out our window. Ya know, life is pretty good and there’s a lot to be grateful for. Me: Yeah. You’re totally right. There is a lot to be grateful for. I need to remind myself of that more often. This bias developed because the ancient mammals, primates, and early humans that were all mellow and fearless did not notice the shadow overhead or slither nearby that CHOMP! killed them. The ones that survived to pass on their genes were nervous and cranky, and we are their great-grandchildren, sitting atop the food chain, armed with nuclear weapons. In effect, the brain is like Velcro for negative experiences but Teflon for positive ones. The problem with the negativity bias is that we are no longer cavemen, but our brains haven’t quite realized that. Of course there are real threats in the world and things that our biological negativity bias is useful for. The issue is that our brains are stuck in negative overdrive most of the day without us even realizing it. There are many ways to shift the brain from negative to positive. This will be a continued topic that I’ll keep exploring in future posts. Right now I want to focus on one of the simplest yet powerful methods I have found to increase positivity and overall wellbeing: cultivating gratitude. It is a seemingly simple yet powerful practice. It is so simple that I have often overlooked the practice in the past. Gratitude is one of the topics that we spent the longest time exploring in my Happiness Art Therapy Group. Sometimes gratitude comes completely naturally. When my children were born and placed in my arms I felt an indescribable sense of gratitude. It can also come in smaller everyday forms, such as gratitude for the cup of coffee in my hands that is warming my body and waking me up. Focusing on one thing that we are grateful for begins to open our hearts – gradually shifting us from our fear based negative thinking to a love based positive state. I have found that each new thing that I express gratitude for creates an even greater ripple effect. 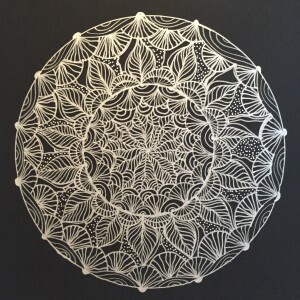 Creating gratitude mandalas takes the practice of gratitude to another beautiful level. All you need is a pen or pencil and a piece of paper. 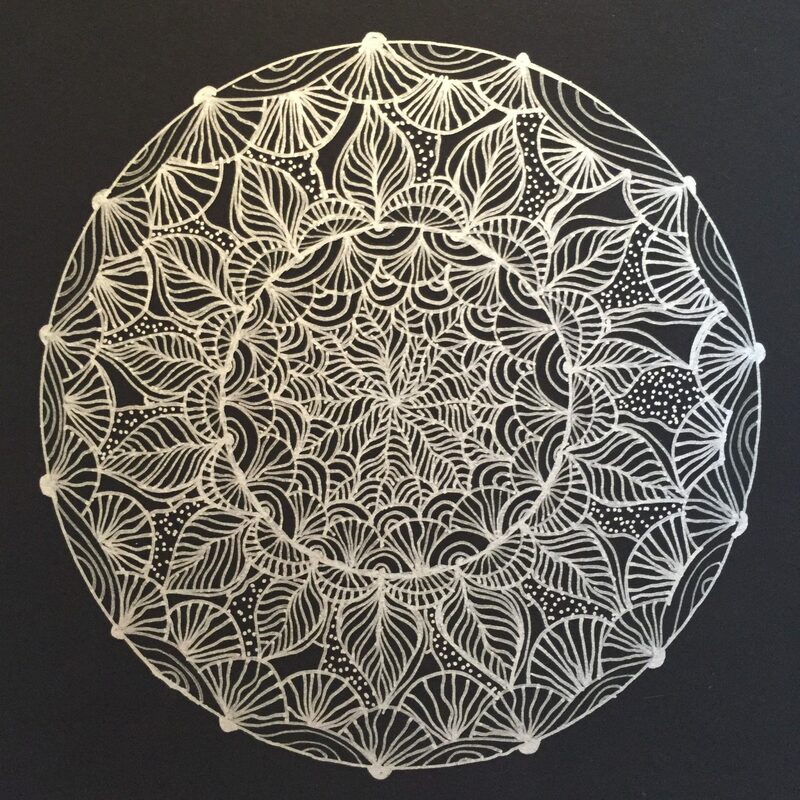 The mandalas in this post were created with white paint pens on black paper. I love the contrast of the white line work on the black paper. If you want more color, grab some colored pencils or watercolor paint and a fine brush. You can trace a circle or draw one freehand. If it helps, find the center of the circle and mark it in a way that serves as a visual centering point. Next, take some deep breaths and focus on relaxing your mind and body. Then, begin to write down anything that you feel gratitude for within the circle. Experiment with the direction of the writing, the size of the words, and the way they flow. 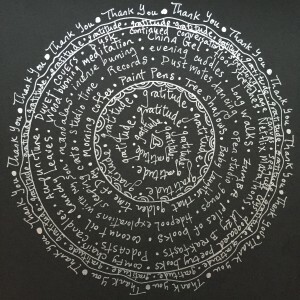 Your gratitude words can be something on a larger scale such as ‘my family’ or something seemingly mundane such as ‘the way dust motes dance in the light.’ Perhaps you can create multiple gratitude mandalas – some that focus on the broader categories, and some that celebrate all of the smaller things you feel grateful for. One of my gratitude mandalas (top of page) was created with small everyday things in mind and finding beauty in the mundane: piles of books, paint pens, podcasts, and lazy breakfasts. I wrote things down in a stream of consciousness without editing my words or overthinking them. silently meditated on the things that I am grateful for as I began to draw. The mandala is a visual representation of the gratitude I felt that day. This is an example of creating art while holding a specific intention of gratitude. To me, this mandala looks like it is expanding outwards – which is exactly how my heart felt while I was creating it. I will share some more art therapy ideas for cultivating gratitude in future posts. 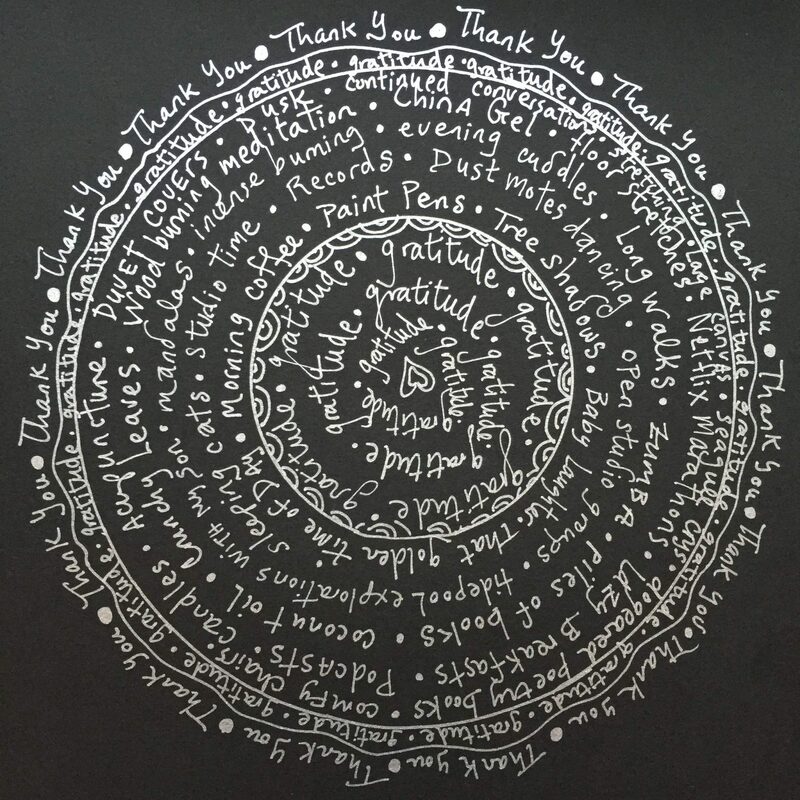 In the meantime, create some of your own gratitude mandalas and feel free to share them here! A beautiful and inspiring site entirely devoted to cultivating and practicing gratitude. This article really resonated with me and hopefully with you too! A nice listing of various articles related to gratitude. 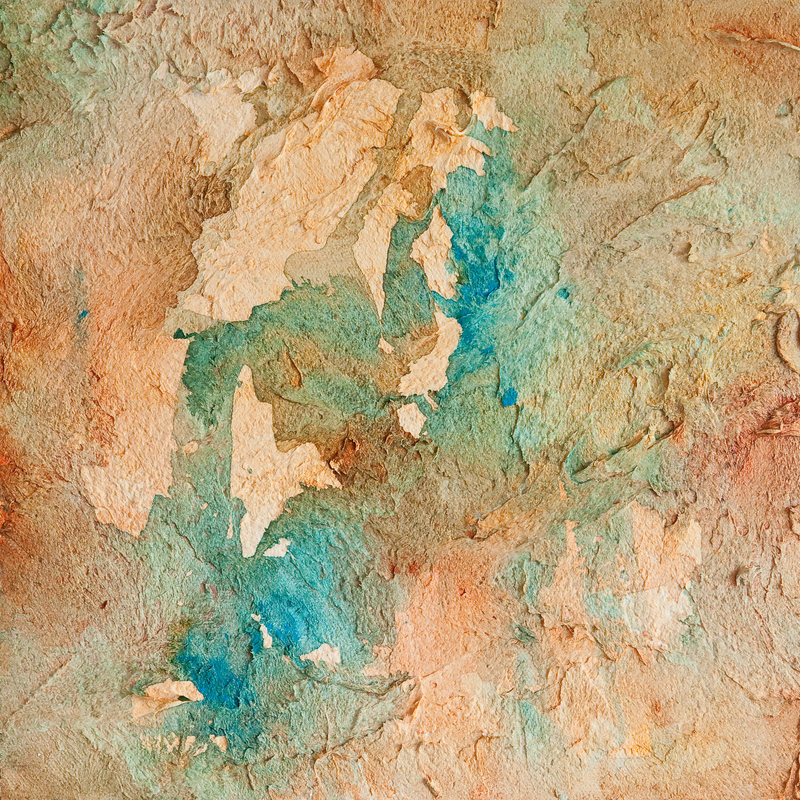 This is Janet McLeod’s art therapy site and it is full of interesting interviews with other art therapists. The focus is on the integration of Positive Psychology & Art Therapy and there are many posts pertaining to weaving gratefulness into art therapy practice.